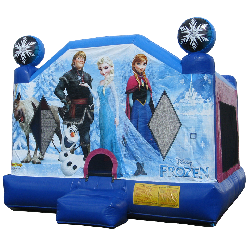 Relive the fun moments with Olaf, Elsa, Sven, Kristoff and Anna in this Frozen bounce house rental. One of the best animated movies ever made, is now a bounce house ready for happy kids to enter. Like Disney princesses? We offer a Disney Princess themed bounce house that includes Belle, Cinderella, Jasmine, Sleeping Beauty and Snow White.